Mountz Inc., a specialist in providing torque and fastening solutions, today announced that it has been recognized as one of the 2016 Bay Area News Group's Top Workplaces. "We are honored and humbled to once again be recognized as one of the Top Workplaces in the Bay Area," said Brad Mountz, President & CEO. 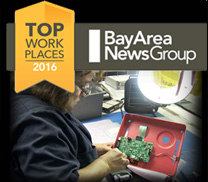 Mountz Inc., a specialist in providing torque and fastening solutions, today announced that it has been recognized as one of the 2016 Bay Area News Group's Top Workplaces. This year's recognition marks the third consecutive year Mountz has been selected for the annual list. The Top Workplaces program was established to acknowledge Bay Area companies that have provided a healthy work environment for their employees. The Top Workplaces are determined based solely on employee feedback. The employee survey is conducted by WorkplaceDynamics, LLC, a leading research firm on organizational health and employee engagement. Employees were asked to rate their satisfaction with several aspects of working at Mountz, including company leadership, workplace culture, compensation, training, career development, values and ethics, just to name a few. "We are honored and humbled to once again be recognized as one of the Top Workplaces in the Bay Area," said Brad Mountz, President & CEO. "Receiving this award for the third consecutive year is a testament to our ongoing commitment to create a positive and rewarding work environment for our employees. It is part of the core values at our company." The Bay Area News Group selected Mountz, Inc. as one of the top small businesses to work for in the Bay Area on its 2014 and 2015 lists. The list of Bay Area Top Workplaces were published in Bay Area News Group publications—including the East Bay Times and The Mercury News—on Thursday, June 23, and is available online. Mountz, Inc. features two other product divisions: Mr. Metric® and MountzPro®. Mr. Metric is the leading metric fastener specialist in North America. Well regarded as experts in metric, Mr. Metric is known for hard to find metric items at competitive prices. MountzPro offers tools for the professional market with the goal to make fastening easy for the professional and weekend mechanic or other service technicians. Since 1965, Mountz has proven its in-depth knowledge of torque solutions by consistently developing, producing, marketing and servicing highly sophisticated, cutting-edge tools. Mountz Inc., known to the industry as the nation's premier torque tool supplier, is an ISO 9001 registered and ISO 17025 accredited company. Mountz tools comply with ISO 6789:2003 and are constructed from high quality materials, engineered for superior reliability and safety and backed by an industry leading warranty. Making a safer world through accuracy and precision is the core purpose of Mountz, Inc.